When I was a senior in high school, our school art club got together to draw and sell a coloring book. Over the course of three club meetings, we assembled a series of pen and Sharpie marker drawings, which our teacher photocopied and stapled to form makeshift books. We sold the coloring books outside the trophy case on the second floor for $2 a piece. 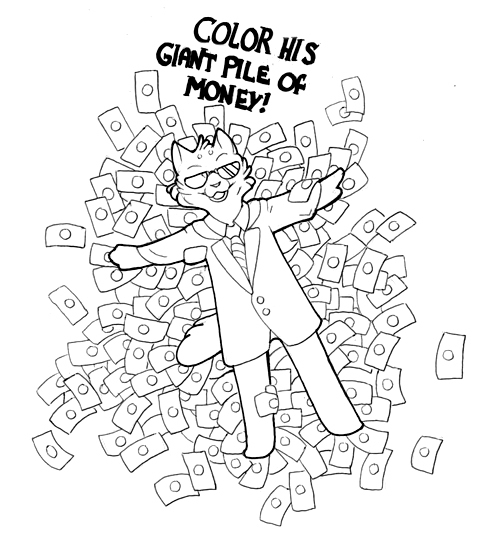 I contributed five line drawings to the book: three comics, a horse drawing, and a drawing of our superintendent as a cat, rolling in money. There were picket lines. The protest reached its zenith when hundreds of students, teachers and parents swarmed a school board meeting. Community members addressed the superintendent directly, asking him to turn down the raise. The rally went on for over four hours, dozens of students and teachers cycling through the door as the superintendent looked on with little reaction. In the end, the superintendent disregarded the community’s opinion, and the school board went forward with the raise. The art club coloring book came to fruition two years after the local newspapers announced our superintendent’s pay raise. I was still full of teenage salt, as my superintendent cat drawing showed. After we sold our first round of coloring books, the trouble began. Students at my school referred to my art teacher as “a national treasure who must be protected at all costs.” My high school experience was a bit like chemical warfare, and my art teacher helped guide me out of the subsequent rubble. He was fundamental to my development as an artist and as a person, so when he asked me for permission to recall the coloring books because of my superintendent cat drawing, I obliged. Actually, my art teacher hadn’t seen my superintendent cat drawing until after we’d set up shop. If the coloring books circulated, people would assume that my art teacher condoned my message. I’m sure my art teacher disliked the superintendent as much as I did—but he was averse to this type of conflict, and I respected his desire to retract my content. Regardless, most of the coloring books had already been sold. A second art teacher owned one of the first-edition copies. This teacher wanted me to print out more pages of my drawings and post them around town. I don’t think he was aware of my other art teacher’s position. One day, soon after the first few books were released, my second art teacher summoned my third art teacher. They stood reading the art club coloring book, glancing back and forth between myself and my superintendent cat drawing. They laughed a little, and they reminded me of kids with a Mad Magazine propped up behind a textbook. I shared a moment of rebellious spirit with those two teachers; I felt like I’d defaced a portrait of a dictator under the cover of darkness. Then, I was approached by a student from the school newspaper. He wanted to run a story on the superintendent cat drawing, and I really wanted to let him. I knew I wouldn’t be the only one affected by the story, though, and I took a day to consider my options. I had the viewpoints of my art teachers to consider as well as my own. School newspapers frequently wandered off school property, and ended up under the thumbs of curious parents. My first art teacher could face some hard questions if my superintendent cat drawing found the wrong readers. Ultimately, I declined permission to run the story. I graduated later that year, and our superintendent left the district soon after. It’s difficult to say what would have happened, had I let the situation escalate. I don’t think the article would have caused much of a stir, but I also hadn’t expected the superintendent cat drawing to kickstart a conversation about free speech and social change. I saw how people rallied behind my art, but also how people both feared and anticipated the consequences of my art. I was baffled. After all, to me, it was only a silly cat drawing. I hated making my first art teacher worry, but I loved the camaraderie I shared with the people who laughed at my superintendent cat drawing; who pointed at the page and said, “yeah, %$#&@* that guy!” I felt the shared resolve of my peers and teachers, as strong as the day our superintendent’s raise was announced. I’ve always wanted to use my art to promote representation and spread goodwill, but my superintendent cat showed me the real power of art. Simple cartoons can kickstart political discussions, which can trigger action and social change. I learned that I had to be careful with my art, since real people—both people I cared about and people I wished to tear down—could be seriously affected by my work. Since “superintendent cat,” I’ve proceeded carefully with my political works.